Even before the Savannah College of Art and Design stepped into the art scene, art in Savannah flourished. 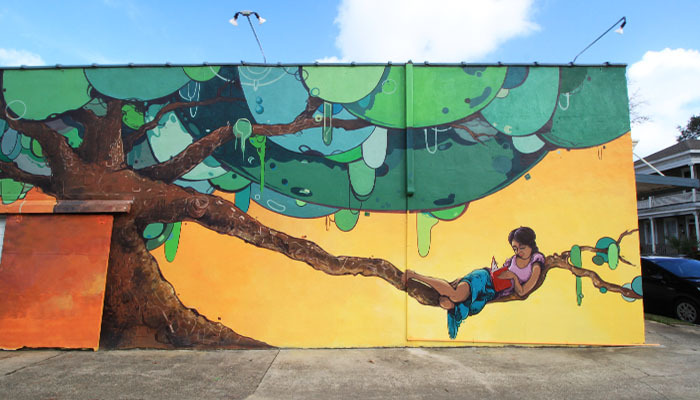 But over the last decade especially, bland brick buildings and functional façades have transformed into art pieces, signs of encouragements and community outreach opportunities. Artists have collaborated with small business, big corporations and everyday townsfolk to breathe life and creativity into Savannah’s historic buildings and paint the city better and brighter. However, finding the many murals of Savannah might require venturing a little off the beaten path, past the Historic District. 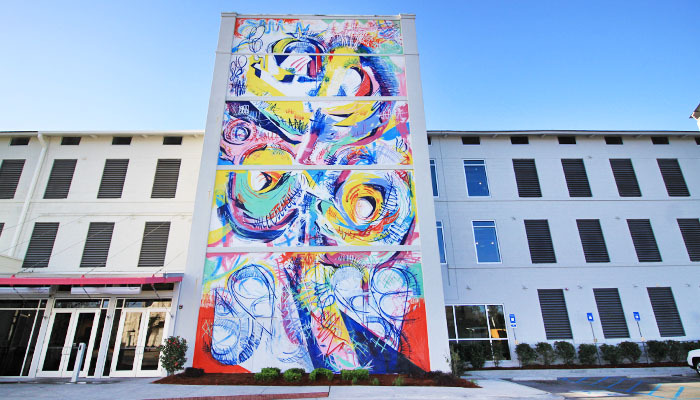 On the face of SCAD’s Montgomery Hall building is an explosive mural by artist and co-founder of Savannah Art Walls, Matt Hebermehl. The four-part mural welcomes students and visitors alike with its vibrant colors and chaotic movement. Every art lover and design junky walking into the doors of “Monty” gets a touch of inspiration before crossing the threshold to create their own art. 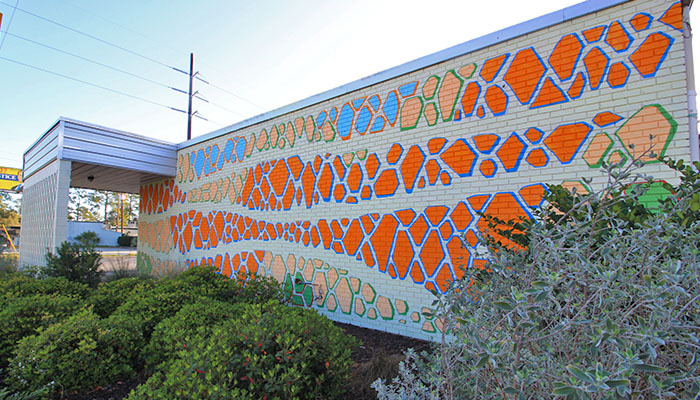 Kellie Walker’s spotty and Islamic-art inspired mural was made in conjunction with Kayak Kafe in Midtown. A once beige brick wall was brought to life with Walker’s bright geometric shapes. A SCAD alumna, Walker returned to Savannah from L.A. not only to bring life to the block, but also bring the Latin and Caribbean flavors being served inside the restaurant outside. 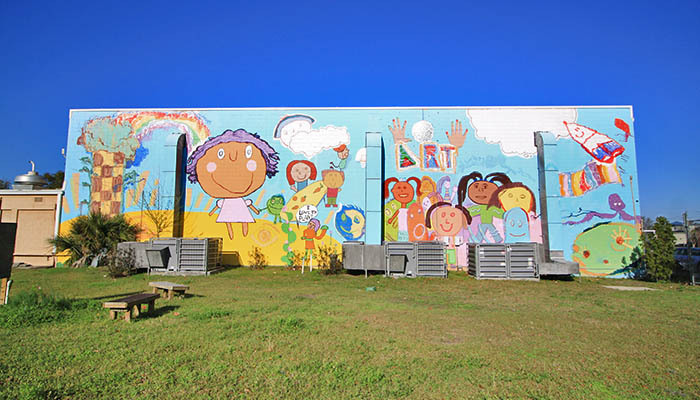 In a collaborative effort, students of the West Broad YMCA art program teamed up with Mike Williams, Jose Ray and Matt Hebermehl to liven up the center with a mural that tells the stories of the children that attend The Y. The childlike and innocent art that covers the space narrates the life of the little one’s who come to the YMCA and gives a pulse to the once forgotten West Broad Street. Local artist and DJ Jose Ray brought his brush down on 40Space giving it a touch of a Savannah scene by painting woman lounging under Spanish moss, reading a book. A languid yet lively scene, Ray depicts Savannah through its favorite medium: art. Ray leaves his artistic mark on the oak tree with his tongues and drips. Emergent Structure’s E.34 Greenhouse has been a staple in the community since 2013. And in late 2016 the walls of the greenhouse were brought to life to reflect the life that lay inside. 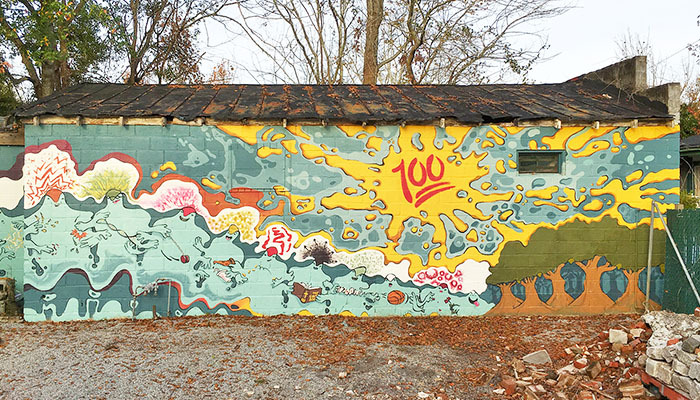 SCAD alumni Lydia Batchelder and Justin Montan, along with three local student artists Jeffrey Stevens and Calin and Cameron White, collaborated with The Dream Campaign in an effort to build a better Savannah and hope to the area. Tommy May, the man behind the SAFE Lee brand, adorned the wall of his pre-existing Lee O’Neil Gallery with a painting of two profiles. The gallery, owned by May and his girlfriend Gwen O’Neil, was open from September 2015 to late June 2016. 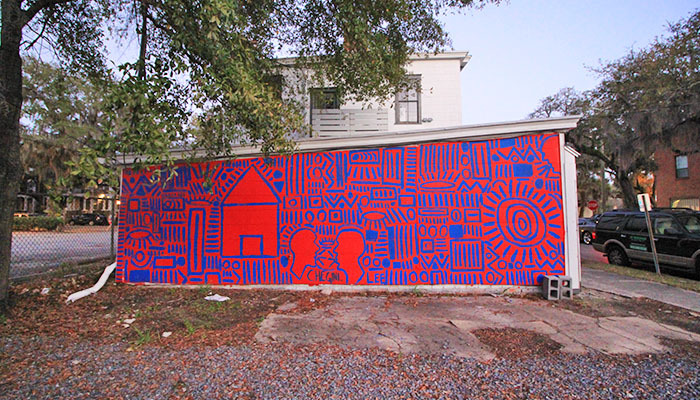 May, a SCAD photography alumnus collaborated with friend and also SCAD graduate, Brian Chegini, to deck the wall of the gallery with contrasting red and blue colors and his infamous brush strokes and characterizing design technique. Although the gallery is now long gone, the mural remains. A 43-foot wall was no match for Cierra Selby. 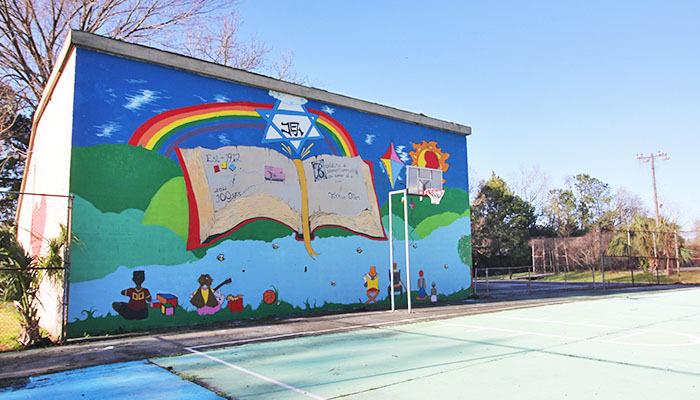 Selby, who is not actually an artist, bound together with local artists so they could leave their mark on their community and aid organization like the Jewish Education Alliance. Selby gathered more than 60 people to pay tribute to the Jewish concept of “Tikkun Olam,” the “repairing of the world,” through social action and justice. Vermont native and national artist, Mary Lacy, swooped into Savannah with a new project in mind. 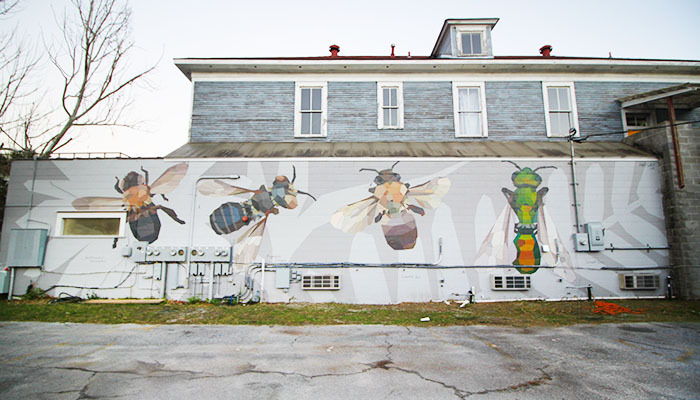 Lacy, in collaboration with Art Rise Savannah and locals, created a 13-by-40-foot mural depicting four native Georgia bees. Painted in February 2017, the mural is something to look out for during your next visit to Savannah. 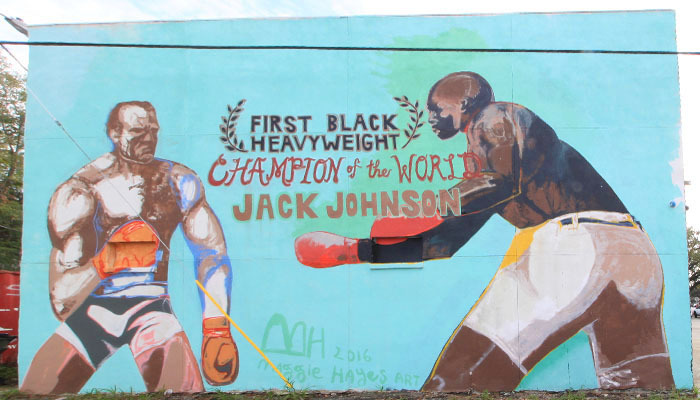 Savannah local artist, Maggie Hayes painted a tribute piece in memory of Jack Johnson titled, “The First Black Heavyweight Champion.” As part of her No Man’s Land exhibition at Welmont Gallery, Hayes explored masculinity through various artistic mediums in her work. Hayes’ first ever work of such a scale hangs on the north wall of the Welmont for all to see. 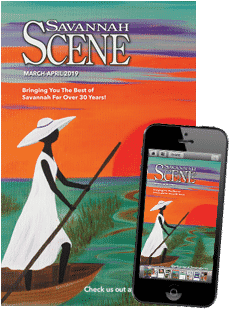 Katherine Sandoz’s mural at Edgewater Trace apartments on the Southside depicts scenes Savannah is known for, the land, skyscapes and waterways of the city. In an effort to enhance the residents’ experience, Sandoz was commissioned to create a camouflage scene. 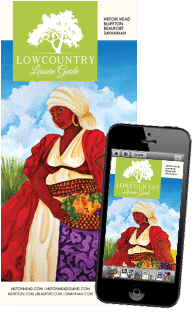 The mural calls attention to the already existing beauty of the Lowcountry’s landscape. A talk of the town, the late and great “Sandman,” no mural list would be complete without Miller. Encouraged by friend and award-winning interior designer Jane Coslick, Miller began to experiment with painting garage doors and wall art as opposed to his usual sign painting. Miller is known for his signature script on buildings and businesses around town. But while most of his work has faded away over the years, or been destroyed during the deconstructions of buildings he has touched, his legacy remains and hints of his work still live throughout Savannah.